I’ve been having a bit of a bad week and I’m not able to do much about it. It’s times like these I REALLY really want some good manga to cheer me up and entertain me so I’m not caught up in worrying about myself. Despite having a large stack of manga to read through and plenty of little things I could work on instead, I find myself wishing my copies of From Far Away (VIZ) weren’t at my mom’s house. 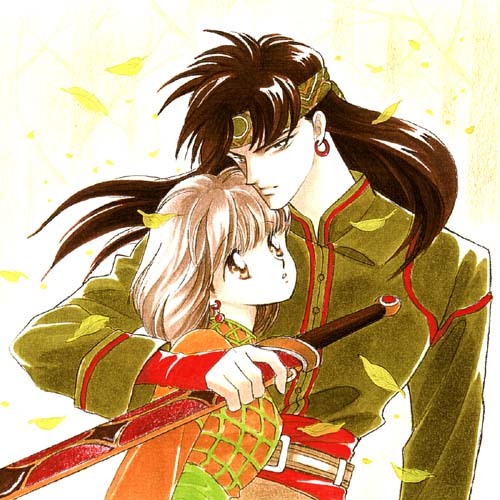 I guess my love for this series explains a lot of my tastes as manga fan, but From Far Away remains the best romance I have seen put to paper in manga and in novels. I never fail to get re-enraptured whenever I re-read the series and it always manages to make me calm down a bit. That’s just one of the great things about manga -their power to make you feel different after you finish a volume. There’s manga that’s meant to cheer you up, meant to make you squeal with girlish delight, meant to make you sad and meant to make think ‘THAT WAS SO AWESOME.’ It’s what gets fans hooked and what someone who has never read manga will never been able to understand why it’s so well-liked. All those naysayers probably just haven’t found that series that they cannot connect to on a deeper level. I’m pretty sure there’s one out there for everyone. With all this manga out there, inspiring all sorts of emotions, which manga inspires the most emotions from you? This entry was posted in manga and tagged emotions, From Far Away, manga. Bookmark the permalink. Skip Beat! makes me feel all warm and fuzzy and happy. It’s so hilarious and sweet. I laugh out loud reading it all the time. Fruits Basket gives me that warm feeling too, but in a slightly different way, and it also sort of…mellows me out. It’s more gentle. It’s elicited some tears as well. If I want to be depressed, I turn to Saikano, which does that superbly. For “That was so awesome!” – Trigun, all the way. I can’t read stuff like Saikano where the whole point is feeling sad for the characters. I like more tragic stuff where you learn to really love the characters and see their lives before grief hits and then see an end you don’t really want to see. Uh. If you know what I mean. Well, Skip Beat’s already 20 volumes might be a little daunting, too. But if you do decide to look at it, it’s completely worth it. It’s one of my absolute favorite titles. I think I get you, though. Saikano is very…I mean it’s depressing the entire freakin’ time. I love the characters, but the grief hits pretty early on…almost immediately really. But I think it’s very sweet. It’s tragic but…it’s touching, you know? And there are moments in there, where it’s just the boy and the girl, and they’re living their life happily and in peace for a while. But yeah, it does kind of make you feel miserable a lot; Gunslinger Girl does that, too. But I think what you’re saying is that you’d rather see the characters grow for a while, without a sort of…shadow of death hanging over them all the time. Yeah, that’s daunting, but I keep hearing SO MANY GOOD THINGS. I should just take the plunge. Trigun… I guess I just don’t notice it. It doesn’t quite hit classic for me because it was relatively new in the U.S. when I started reading manga, I guess? But yeah…I can’t do the whole looming shadow thing. It starts to get predictable for me, so it gets too sad that there will be no happy ending. I really do like that progression from normalcy to violent change. Does your local library have Skip Beat? I was putting it off for a long time too (20+ volumes is scary for my bank account, not to mention my poor bookcases), but last summer I finally caved and borrowed the first 2 volumes or so from the library… and the next 3… and some more… and then I decided to buy the next ones I needed to read… and then I borrowed some more from the library… and then I bought a few more… and then suddenly I was caught up and waiting impatiently for the next volume (and with a rather random assortment of purchased volumes). It’s very addictive and awesome. A little over a year ago, my family was going through some unpleasant stuff, and one series I really appreciated at that time was Me & My Brothers. It’s incredibly fluffy and has one of those ridiculous shoujo premises, but I think it carries the premise out with a good heart. I always enjoy reading the series, but when I was down and needed some cheery family cuteness, it was just the right thing! My local library… where is it? I don’t even know. Honestly, I’m not a huge library person and I should probably change that, but I’ve also been moving A LOT recently and am planning another move… Although really, I live in LA now, so maybe they have a huge system I could just join once to spare me the trouble. I will look into it, thanks for the suggestion! As for Me & My Brothers… I did not enjoy that, sorry to say. I’m glad someone does though. Kaze Hikaru I should try again. I read a bit and wasn’t that interested, but it deserves another chance.